With: Bruce McCune, Katie Glew, Linda Geiser, Daphne and Jeff Stone and Heidi, their dog. 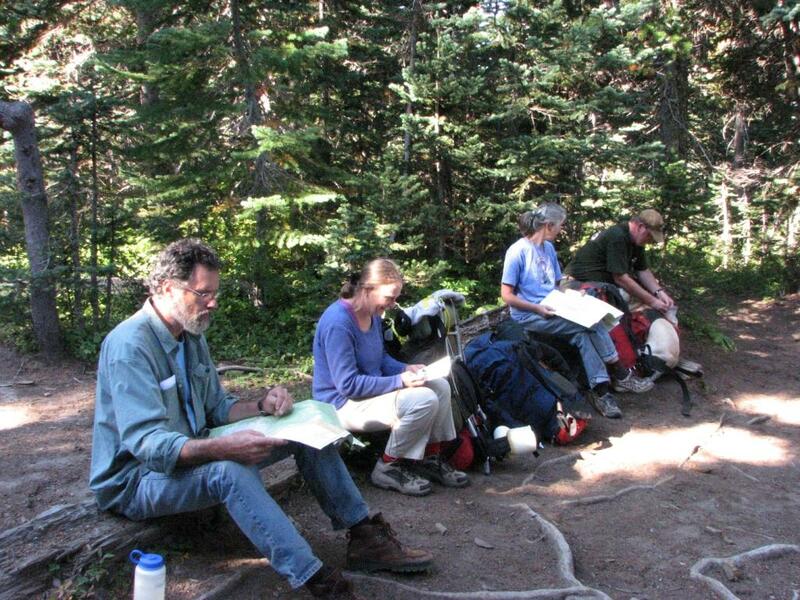 9/11/09: Once everyone arrived at the Potato Hill trailhead and loaded their packs we set off down the Pacific Crest National Scenic Trail a little before 10:00. Our destination for today was a campsite at a place called Lava Springs. With high spirits and eager anticipation we hiked south on a gentle trail 1.6 miles to a beautiful spring that pours ice-cold, clear water from the base of the Muddy Fork Lava Flow where we made camp. We then ate an early lunch before we grabbed our lichen gathering gear and cameras to climb the edge of the lava flow to explore. At the top we encountered one of the rare lichens we came here for, Arctoparmelia incurva. Other species of interest were Allantoparmelia alpicola, Cyphelium pinicola, Ochrolechia frigida, Ochrolechia szatalaensis, several Stereocaulon and Xanthoria sorediata. Back at camp, Katie and I walked out the old Crest Trail as far as one of the forks of Muddy Fork Creek. We found a Boletus edulis and other mushrooms along the way which we took back to camp. Jeff, a mycologist, thought we should take another look around so he and I went back and searched for more. We came back with enough boletes to add to the cooking pot this evening. After supper we gathered around the fire and went through my Mt. Adams checklist of lichens I had given a copy of to everyone at the start of the trip. We tallied 48 lichens on the list and added 14 more. The rest of the evening we sat around the fire and waited for the appearance of the International Space Station. I had gathered the fly-by information before we left and got the times of possible sightings. No-one else in the group had seen it before and they were duly impressed as it sailed across the night sky. 9/12/09: We packed up and left camp at 8:40 on a sunny, clear day. A little over two miles later we made it to the Muddy Meadows Trail where we took a long rest break while we waited for Jeff to catch up with us. He was going a bit slower than we were so he could gather more boletes along the way. Going up the Muddy Meadows Trail from there we added a lot more mushrooms to the collection bag. At another rest stop at Green Timber Camp we encountered a bolete over nine inches in diameter. Not far from the camp we came to the Highline Trail and turned east on it until we stopped at Foggy Flats to eat lunch. We had a visit by a bow hunter while we were there who wasn’t having much luck. By now Jeff had a bag full of mushrooms so instead of packing it all the way up to our next camp and back he stashed it in some trees nearby. From then on we just made mental notes of where we spotted any more boletes. Our progress now took us to the edge of timberline and into the glacial moraines of the Lyman and Lava Glaciers. By the time we got to the first crossing of Muddy Fork Creek the waters were fairly high and crossing was somewhat of a problem. I found a spot that wasn’t too much of a leap from rock to rock and jumped across. The rest of the group were able to do the same after a little searching to find rocks within their bounding abilities. Now feeling proud of ourselves we were soon confronted by the second fork of the creek and it was even worse than the first. I looked for some length of time before I found a couple rocks close enough together. I still had to muster up all my courage and strength to make the leap. Linda was next and had doubts about it. She threw her pack to me and with a helping hand was able to join me on my side of the creek. Next came Daphne and Katie. They didn’t like any possible routes they saw and doffed their shoes and waded through the muddy waters. This put us at the site of our next camp once we climbed the hill above the creek. Along the way we passed the trickle we use for our water that was now just a dribble at this time of the year. I set my water jug under the drip and proceeded on up to where we are to camp. We soon found our tent sites and began setting up camp after taking a short break. Everyone took things easy this afternoon and other than fetching water didn’t do much until supper time. After we ate we went to the lava flow above camp to see what we could find. Another one of the rarer lichens we saw was Usnea lambii (sphacelata). We also noted Rhizoplaca melanophthalma, Psora globifera, Ophioparma ventosa and Thamnolia vermicularis. This evening we sat around the fire and waited to see the space station go over again at 7:50. After I toasted my Pop-Tart we stayed up a little longer to observe the space station again since it makes an orbit every ninety minutes. 9/13/09: Once again we departed camp a little after 8:30 but this time wearing day packs instead of our heavy backpacks. We made our way back over to the Highline Trail and then up it far enough to avoid the lava flow to a place where we could easily cross over to Red Butte. After a scramble up the loose cinders of the volcanic cone we made it to the rim at the top and commenced to see what lichens we could find. After filling a few bags and packets we headed back down to the base of Red Butte. Instead of cutting back over to the trail we turned straight up the hill and worked our way through the boulders and krumholtz white bark pine to the top of the hill and Devil’s Gardens. We found a place out of the wind to eat lunch then went around the area doing our collecting. This was a prime area for the Usnea lambii and Lecanora pringlei. Also gathered were Nodobryoria subdivergens and Umbilicaria virginis. After a group picture and a few minutes more to explore we headed back down the trail to camp. After the usual evening routine of supper, a fire and another fly-over of the space station we all went to bed. A final reading of our checklists tonight and we had marked 65 lichens from the list and added 29. 9/14/09: It was windy this morning and clouds could be seen moving in from the west. It was damp and misty as we made our way down to the first crossing of the Muddy Fork Creek below camp. The cool temperatures of the night had allowed the water to drop to a much lower level so the crossing was a matter of one stepping stone after another. On down through the moraine and back into the timber we made good time except for the occasional pause to gather another bolete along the way. At Foggy Flat we stopped for a break and so Jeff could get the bag of mushrooms he had hidden in the trees. Imagine our disappointment when opening the bag to see a mass of maggots crawling all over the boletes. The warm weather and enclosed bag must have caused every worm to hatch and start chewing away. Back at Lava Springs we stopped for a break and so Bruce could fill a bottle with some of the spring water. As we were waiting around we were able to check off another five lichens. On the trail we hadn’t gone but a quarter mile when we met Richard Droker and Sharon Baker. They had signed up for the trip but Sharon got sick the night before we left and had to back out. After another mile we were back at the trailhead and the end of another wonderful trip.